Howard M. Talenfeld, a child advocacy attorney and shareholder with Colodny, Fass, Talenfeld, Karlinsky, Abate & Webb P.A., was among the attorneys honored at Lifestyle Media Group’s inaugural Leaders in Law event. Firm Shareholder Joel S. Fass was selected as a finalist for the awards. Both attorneys, along with the other honorees, were recognized this week at Southeastern University in Davie. 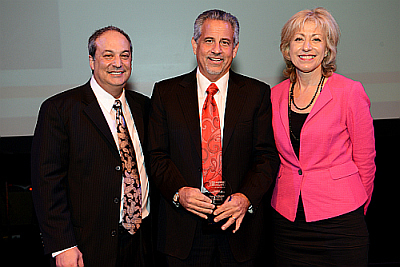 Mr. Talenfeld (pictured here with Lifestyle Publisher Gary Press and First Southern Bank President/CEO Lynne Wines), has been a shareholder in the firm since 1982 and founder of Florida’s Children First, the state’s premier child advocacy organization. He focuses his practice on protecting the rights of vulnerable individuals in civil rights cases, personal injury cases and systemic reform litigation. He is also experienced in litigating complex commercial and class action cases in state and federal courts. Among his honors, Mr. Talenfeld has been named in Florida Super Lawyers Magazine since 2006 and was selected by the South Florida Business Journal as a Key Partners Awards honoree in 2012. Additionally, he has been recognized as a “Top Lawyer” in the South Florida Legal Guide. In 2013 he was named among the Daily Business Review’s Most Effective Lawyers in the Public Interest category. The Leaders in Law Awards is a unique program created by Lifestyle Media Group to honor the lawyers, law firms, and corporate counsel that promote excellence in law, maintain the highest level of ethics, show a commitment to their community and are proven leaders. Nominees were judged on outstanding litigation, advocacy, counseling, and advancements to the legal profession, as well as contributions to the advancement of the bar, such as public service, bar association activities, and pro bono activities. In a letter entitled, “Scott and DCF must get it right,” Florida children’s rights attorney Gloria Fletcher argues in the Tallahassee Democrat that she and other child advocates are watching closely as Gov. Rick Scott weighs candidates and implications surrounding his next choice for secretary of the Department of Children and Families. The reason is clear, she says.